Innovation is increasingly a key requirement for economic growth. The story is no longer about Copied in China, but Made in China. The same is true throughout the Asian region. Unfortunately, until now, there’s been no easy and efficient way to build an Asia Innovation exposure. After months of discussions with clients, followed by months of research and data clean-up, we are pleased to announce the launch of the Premia FactSet Asia Innovative Technology Index. In this post, we cover the rationale, methodology and result of this innovative approach to capturing Asian growth. To ask us a question, or express your interest, click here. Over the past few months, many of our clients expressed concern about global growth and how to adjust portfolios to capture it. Most agree that the bright spots are US and Asia, and that some form of exposure to technological innovation is needed to capture the transformation that is occurring in nearly every industry. Following the launch of our China A strategies, we were approached by investors who wanted to get more granular in how they target Asian growth. A broad MSCI AxJ exposure captures the largest stocks but does not necessarily target the key trends of Asian innovation and Asian consumer growth. For our next set of strategies, we set out to create a way to target both these themes. In this post, we’ll focus on Asian innovation and will cover Asian consumer growth in a week or so. What is Asian innovation and why focus on it? Asia is home to 60% of the world’s population, creating immense opportunities for adoption and leap-frogging of technology improvement. 8 of top 20 countries by population allow new solutions to scale faster than in most other markets. Countries without strong bank penetration are skipping branches and going straight to mobile banking. A newly-formed middle class doesn’t go to malls but shops online instead. More hands-on and competitive governments actively support domestic innovation. The list goes on and on. 1. Digital Transformation: ~60% of Asia’s GDP will be driven by digital products or services in 2021, according to Microsoft. 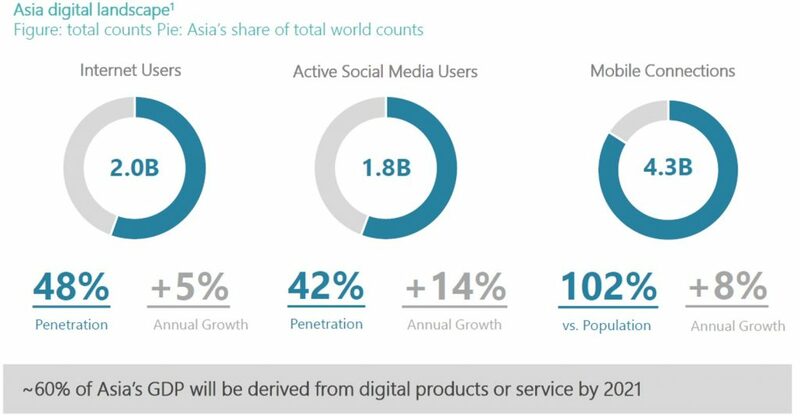 The region has the highest digital penetration in the world: 2B internet users, 1.8B active social media users and 4.3B mobile connections. Digitizing business activity seems like a no-brainer given the scale of adoption possible. As an example, Indonesia has more Facebook users than the U.S. WeChat, WhatsApp, Line, KakaoTalk and Viber all exist with tens / hundreds of millions of users in the region (and that’s just the apps I use daily). Local innovations by each of them allow for digitization of business not possible at smaller scales elsewhere. 2. 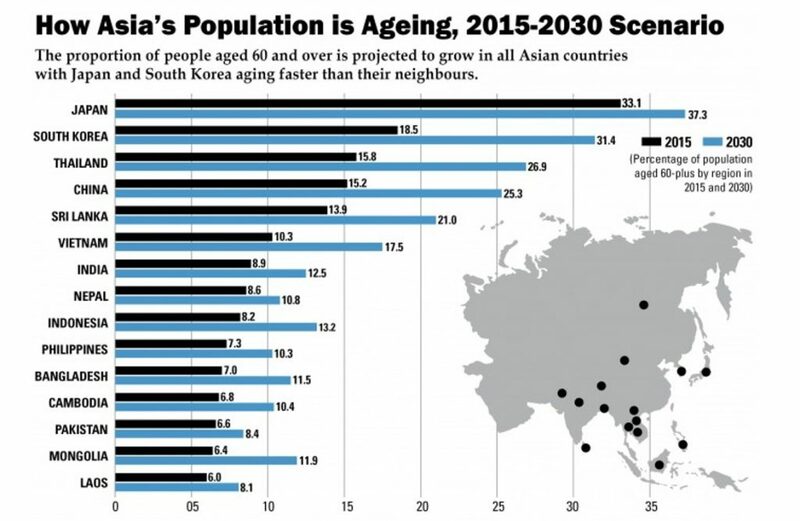 Health and Life Science Innovation: Asia will be home to over 60% of the world’s 65yrs+ population by the 2030s. This has massive implications for healthcare innovation. Pharmaceutical models will need to shift from volume to value. R&D laboratories will be upgraded throughout the region. Medical records will need to be digitized and initial diagnoses will be automated. Wearable health applications will become the norm as hospitals and insurers expand their data gathering. 3. Robotics & Automation: Asia is the world’s factory, but that title is increasingly under threat. Labor costs are rising due to an aging population, increases in education and expansion of service industries. All these trends are putting a ceiling on workforce capacity. The only solution for Asian economies is to aggressively invest in automation. 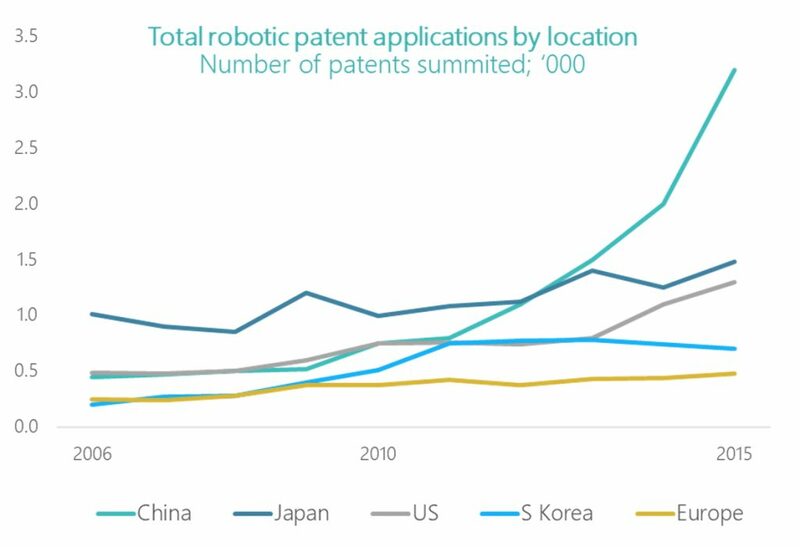 Japan has been at the forefront for quite some time, but China has exponentially ramped up its robotics R&D over the last 5 years. Use cases range from automated fulfillment centers, farm irrigation and crop maintenance, autonomous transport for the elderly, etc. What’s wrong with existing innovation or technology solutions? There have been several mega-trend products launched in recent years, both active and passive. While we don’t profess to have the right answer, we’ve observed and heard of a few challenges from Asian investors with these products. Too granular: many are focused on only one theme or area of innovation, forcing investors to choose or maintain a portfolio of themes. Neither seems ideal given the difficulty in thematic sizing and potential risk of overlaps. Global vs Asian: there’s an argument to be made that innovation removes borders and that these trends are global. However, ultimately, we’ve heard from investors that a) adoption will happen faster in Asia, b) domestic & national security priorities will require local leaders, and c) they are simply more comfortable with the names they know. To each their own of course, but the message to us is clear – an exposure that targets Asian innovation is in demand. Moving beyond tech: there is no shortage of technology sector ETFs and funds, but many of them miss the point that innovation has moved well beyond the tech sector. FANUC is a leading robotics manufacturer that is classified as an Industrial. BeiGene is an R&D lab that happens to be focused on cancer research. An all-encompassing definition is needed beyond GICS. Valuations & Size: many products weigh by market cap, diluting exposure to the theme and leading to concentration risk. In Asia, Alibaba and Tencent would dominate any market cap portfolio to the point that the rest of the exposure may not influence returns. Transparency & Certainty: a thematic exposure does not fit neatly inside a box, making transparency and clarity critical. Relying on an active strategy requires certainty in the team and process, as well as monitoring for drift away from the desired themes. China as a proxy: this is my personal favorite, as many investors target Asian innovation through the top few Chinese internet stocks. For an Asian innovation strategy to add value, it must offer something beyond a 5-stock position that can be replicated via single stock positions with ease. How does the Premia FactSet Asia Innovative Technology strategy work? So, if you are a buyer of the concept you now need to know how we build it. To target Asian Innovation, we partnered with FactSet to leverage their Revere Business & Industry Classification System (RBICS), i.e. their revenue breakdown for every listed company globally. Like active managers, we dissect company revenues and identify those that make money on our priority themes. In fact, we target 132 out of 1,400 RBICS industries. To give you a sense of granularity here, GICS only goes to 157 sub-industries. Here’s an example of how it works. A GICS approach to classification would show Nidec to be a traditional industrial manufacturer of electrical components. But a deeper dive shows that ~45% of their revenue is generated from Motion Control and Precision Motors, Factory Automation Makers and Data Storage Drives and Peripherals, exactly the kinds of things you need in a Digital Transformation and Robotics & Automation world. What does the Premia FactSet Asia Innovative Technology strategy actually own? First, let’s cover the big picture. The exposure is largely North Asia, with China and Japan leading the way. China is the biggest exporter of goods & services in the region and Japan is driving the automation revolution globally. From a sector point of view, ~64% is technology, but healthcare, industrials and even consumer stocks are all innovating their way to future growth. Most importantly are the key characteristics on the right. 73% of revenue comes from our innovative industries. That’s extremely targeted. More importantly, this growth exposure has a forward PE of only 20x. It’s a high-quality tilt as well – R&D, margin, growth forecasts and ROE are all above average. One of the key value adds is diversification – allowing innovation at all market cap levels to contribute to returns. Below we show the 50 equal weight stocks and the market cap or 10% cap alternative. 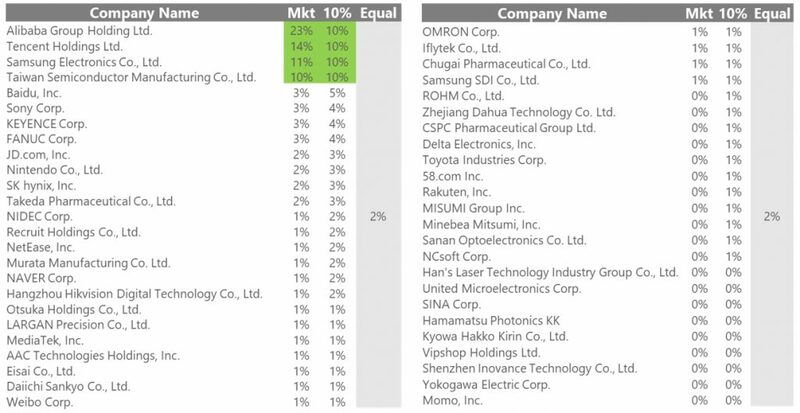 Alibaba, Tencent, Samsung and TSMC would dominate with 40-60% of the portfolio. You can easily buy these 4 stocks yourself! More importantly, look at the stocks on the right – many would simply be irrelevant, despite their contribution to innovation throughout the region. How has this strategy performed over the last few years? Finally, of course, is the critical question. If the approach is intuitive, which we believe it is, does this show up in results. Below are the index returns vs a few common benchmarks in the region. 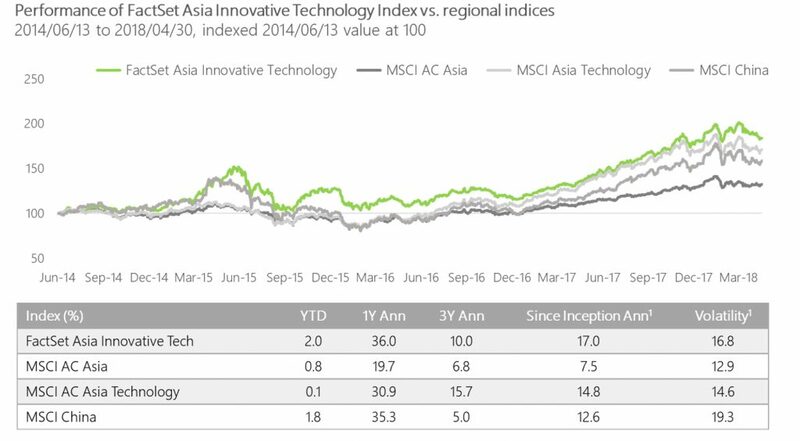 Despite a large underweight to the leading technology firms, our approach has kept pace and outperformed the Asia technology sector, a broad China allocation and a broad Asia allocation. Past performance is no guarantee of future results, especially in a thematic portfolio. So, we encourage you to review the thesis and methodology above and to ask us questions. We will bring this strategy to market soon and would love to have a dialogue with all of you in the coming weeks and months about its merits. To ask us a question, or to let us know your interest, click here.